The words are as valid now as they were then, and just as disturbing. The enormity will seem over-powering. What started out as a supposed peacekeeping document of around 50 pages has, over its 70+ years, grown to many tens of thousands of pages. All the documents start out with obsequious words about the rights and dignity of all people. As you read more you will find these rights and dignity are as they define them in their multi-controlling documents. 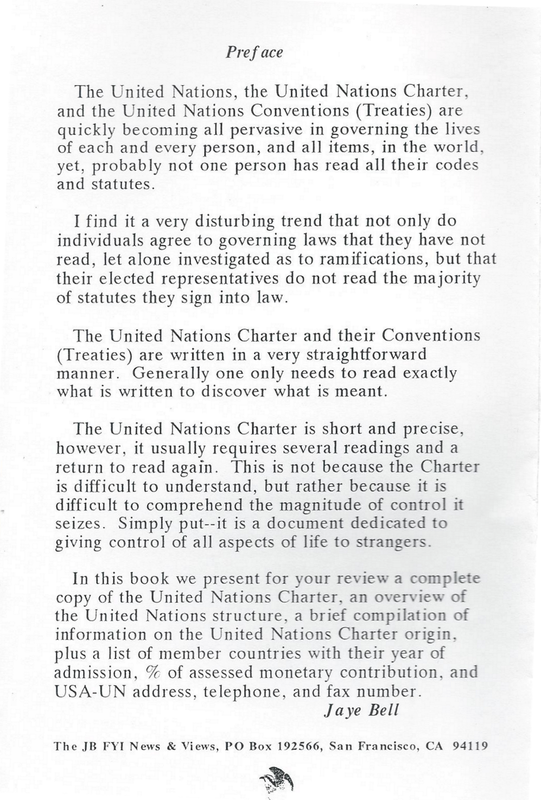 You will further discover the decisions made in the United Nations are made by a majority of the leaders of the 190+ nations, and, this majority is heavily comprised of Dictators, Despots, Communists, etc. The hypocrisy between word and deed is appalling. Check their ‘peacekeeping’ forces’ record of abuse and terrible cruelty over so many years ( particularly in Africa ) and then note there is no accountability as they have immunity. As time permits we will add more and more of the U.N. Documents and articles. These will include their control of immigration into our country, wars such as Korea and Vietnam, even their control allowing China to ship virtually free in the U.S. using our Post Office.